Once during his turn, Sun Quan can discard any number of cards to draw the same number. King Ability: Whenever another member of Wu uses a Peach to save Sun Quan from the brink of death, it provides him with two units of health. 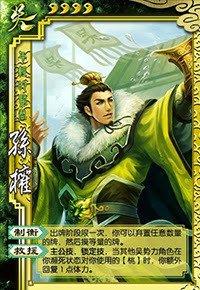 Sun Quan can discard any of his cards whether they are in his hand or equipped for "Reconsider." If Sun Quan discards the Silver Helmet from his equipment area using "Reconsider," he will regain one unit of health. Sun Quan is incredibly versatile. He is one of the few characters for which the 'I drew bad cards' excuse does not cut it when you lose. Being able to get rid of cards that you do not need to draw new cards is great, especially since he can discard and redraw any number. If Sun Quan is low on health, he can discard all of his cards and try to draw a Peach. When Sun Quan has few cards, his "Balance of Power" is dramatically weaker. Because of this, Sun Quan feels the effects of Starvation and Capture more than other characters do. These cards, in effect, decrease the number of cards that he obtains. Starvation does this by skipping his drawing phase and Capture skips the action phase and sends him straight to the discard phase, where he has to discard his extra cards that he did not have a chance to use his power with. Sun Quan is a straightforward character with powers that do not lend themselves well to advanced strategies. His powers are good enough to make up for this, but some advanced players may find Sun Quan to be 'uninspiring' and they may find it more fun to use more complex characters. 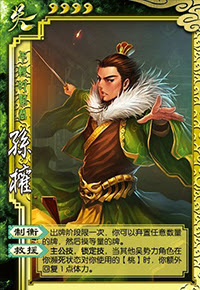 Liu Bei/Gou Jia/Xun Yu/Xu Shu/New Xu Shu - These characters can help Sun Quan by giving him more cards. These characters often appear in the 'Notable Combinations' for many different characters, but the strategy is different in this case because they do not have to give Sun Quan any specific cards to help his strategy so long as he will stay alive until his next turn and does not fall victim to Capture. Quantity is better than quality when it comes to Sun Quan's hand cards because he can trade in the cards that he does not need. 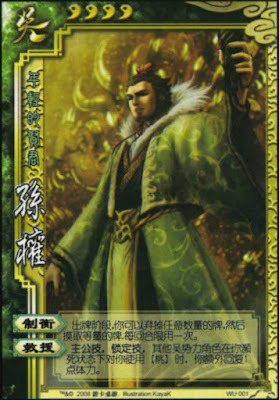 Sun Jian - Sun Quan's father can be a good ally or a fearsome enemy, as he can use his "Brave Spirit" to either increase or decrease the number of cards that Sun Quan has. Da Qiao - Da Qiao has a very easy time with using Capture on Sun Quan. As explained earlier, this will eventually have the net effect of decreasing his total number of hand cards. Xu Huang - Xu Huang has an easy time of using Starvation on Sun Quan. This does not hurt him as much as Da Quio's ability, but it does reduce his drawing power, and hence, the potency of his "Balance of Power." Gan Ning/Zhang Liao/Zhang He - These characters can decrease the number of cards that Sun Quan has with their powers and weaken his "Balance of Power." King Sun Quan is a very good king. The extra unit of health that he gains when there are more than four people playing goes a long way in strengthening his power, as with more health, he can hold more cards. Additionally, "Balance of Power" is a great power for a king, as he can perform well offensively and defensively. Sun Quan is not a bad loyalist, but there are usually better choices. Before picking Sun Quan, check to see if there is another character that you can choose to compliment the abilities of the king. If there are no characters like this in your selection, Sun Quan is probably your best bet. Remember that Sun Quan is more of a stand-alone character. Rebel Sun Quan is a good rebel for the same reasons that he is a good king - his power works well both offensively and defensively. Spy Sun Quan is good as the spy. The spy needs a character that can last a long time. Sun Quan has a good chance of being able to get Peaches when he is low on health. Sun Quan is a beginner's favorite as well as being one of the best characters in the game. He is probably the safest king pick. In addition, he is good in any other role too. His biggest weakness is that he is usually not able to benefit other characters. If you have chosen Guo Jia or Liu Bei and Sun Quan is on your team, consider giving him cards if you or your other teammates cannot use them. He can swap the cards out and possibly get other ones that can help him kill an enemy.